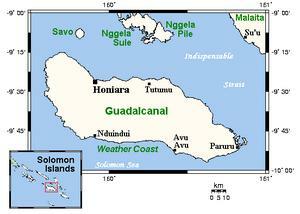 Even though just a small island in the Pacific ocean, Guadalcanal played a huge part in World War II. One of the bloodiest battles of all time was fought on the shores of this historic place. More than 2,000 American men were killed, while the Japanese buried ten times that amount. That many lives lost in only three days. Even if it was a terrifying, not to mention deadly, area 60 years ago, Guadalcanal is now the most inhabited island in the Solomon Islands. With a normally tropical climate as well as beautiful beaches, it makes an excellent tourist destination. The country of the Solomon Islands lies about 200 miles off the coast of Papua New Guinea, another island country in the South Pacific. Whereas 60 years ago there were ripped up planes falling from the sky every minute, ultra-intense combat everywhere, and the possibility that you might set off a land mine with any step you take, I think that one would rather enjoy being on the present-day island of Guadalcanal, one of the most lush and beautiful places in the world.